Kids who love playing house on a small scale can enjoy a variety of plastic dollhouses full of furniture and family. 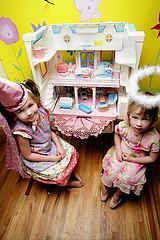 Dollhouses remain a popular girls' toy. They're available in many different types. Some are made of wood, while others are made of plastic. For DIY types, you can even build one yourself. Plastic dollhouses are usually reasonably priced and come with everything a child needs to entertain herself for hours at a time. Lightweight: The lighter weight of a dollhouse made of plastic makes it easy for a child to carry from one place to another. Wooden dollhouses are usually heavier and aren't as portable as plastic varieties. Compact: Many plastic dollhouses you'll find on the market fold up for compact storage. After a girl has played with her dollhouse family for the day, she can place them inside and fold everything up and put it neatly out of the way until she's ready to play with it again. This is an important benefit for anyone who needs to save on space. Affordable: While prices vary depending on the number of accessories you choose for your dollhouse, you can find dollhouses for less than $100. Durable: Toys are often made of plastic so that they can withstand hours of play. Plastic dollhouses will likely hold up to anything a child can dish out. Easy-to-find accessories: Dollhouses often sit on store shelves next to all of the furniture, accessories and family members you'll need. Beds, chairs, tables, cars, vans, sofas, moms, dads, children and more are usually stocked next to the dollhouse they're made for. Different sizes: Some dollhouses are big and can accommodate many pieces and play people, while others are designed on a smaller scale. These smaller dollhouses are even easier to carry; a girl can take one on vacation or on a playdate. The Mrs. Goodbee Talking Dollhouse actually encourages good behavior! There are over 400 activities a child can enjoy, including songs and sounds. With 12 rooms, this plastic dollhouse can easily be played with by more than one child at a time. Fisher Price's Loving Family Dollhouse features eight spacious rooms and a loving family that you can customize. Go for a standard mom and dad with twins or buy members separately to create your own unique family (with or without pets). You'll find accessories for every room of the house and for outdoors as well. For the very youngest dollhouse fans, My First Dollhouse is made with chunkier pieces perfect for little hands and comes with a family of three. This makes an ideal preschool toy. Part of the fun of playing with dollhouses is creating your own family and outfitting it the way you want. Kids can have total control over how their plastic dollhouses are set up and displayed. Whether you have a family of four or a family of ten in a dollhouse, this classic toy is entertaining and sure to bring joy to children of all ages.